Sunday, April 29, 10:00 a.m. — 6:00 p.m. Downtown Brentwood (CA) San Vicente Boulevard, beginning at Saltair and running east to Barrington. Plenty of metered parking along San Vicente and pay lot at the VA north on Gorham. Free Admission! Stop by my booth; say hi …and ask for the Family Discount! Child fingerprinting and free child ID kits, car seat safety checks, fun child-safe activities and more! 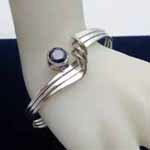 To see more designs from Bejeweled by Gina, visit our our website or become a fan on our Facebook Page.